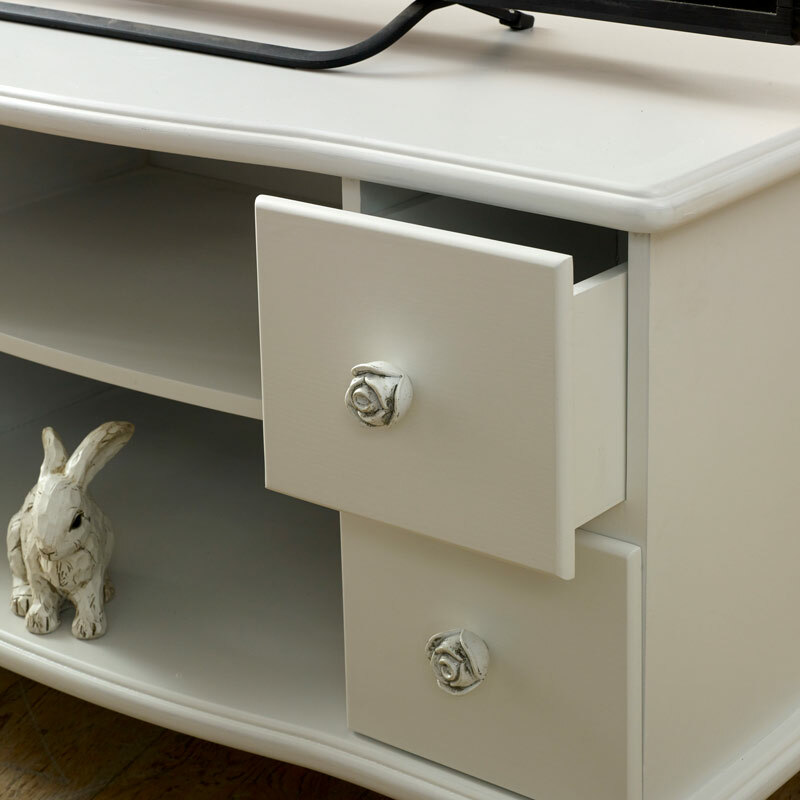 A pretty white rose handled TV cabinet from our Lila Range. Vintage French inspired television unit Shabby chic styled furniture for your living room, painted in a crisp white colour that wil suit any shabby chic room. Delightful teleivsion unit, fully assembled A beautiful TV cabinet that will be the perfect addition to your living room decor. With 4 drawers, each fronted with pretty rose carved knobs, that will be perfect for media accessories. The 2 centre shelves are ideal for holding media equipment. This TV unit is a great addition to our Lila Range and allows you to carry vintage French style throughout your home. A beautiful TV cabinet that will be the perfect addition to your living room decor. With 4 drawers, each fronted with pretty rose carved knobs, that will be perfect for media accessories. The 2 centre shelves are ideal for holding media equipment. This TV unit is a great addition to our Lila Range and allows you to carry vintage French style throughout your home. Made from wood and painted in white. The inside storage on the drawers each measure 14.2cm x 11cm x 28cm (width x height x depth) with the shelves measuring 49cm wide and 34cm deep.